As the 18th gubernatorial poll get closer acts of desperation of hirelings of the APC gubernatorial candidate is becoming worrisome to citizens of Anambra state who hitherto were used to peaceful co-existence amongst ndi Anambra and visitors to the state. The latest act of brigandage took place late Monday at Abba junction Njikoka Local Government Area where group of youths dressed in all black attire reportedly lit fire to Governor Willie Obiano campaign board. When contacted, Chief Mike Okoye a member of the APGA campaign team confirmed the report. “We have already made effort to incident the violent act with the security agencies. 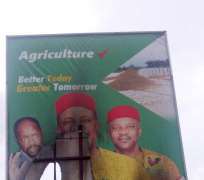 From all indications a pattern of deliberate defacing and destruction of Obiano billboards is emerging and that does not bode well for a peaceful campaign. We insist on peaceful campaigns. Recently, reports of gradual influx into Anambra state of groups of young men from different states with the intent to work for some politicians during the elections have been making the rounds. However, effort to confirm the development with the Police authorities was not successful.